In 2017, Pataka Gallery in Aotearoa New Zealand hosted an exhibition of three Australian artists of Muslim background. One of these, Abdul Abdullah, designed a series of embroideries made by a Yogyakarta workshop, DGTWB. Mission Creep depicts the Hindu Kush Mountain range on the Pakistan-Afghanistan border. 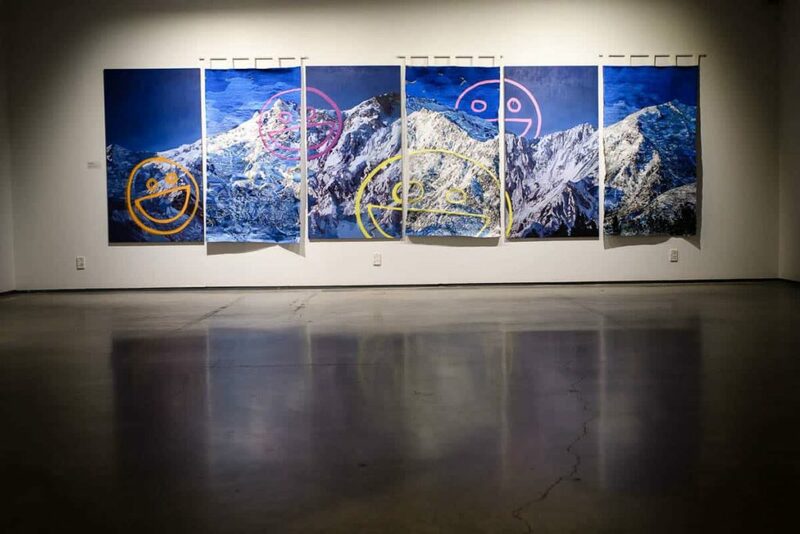 Spray painted and embroidered across the surface of each panel are a series of smiley-face emojis. Smiley emojis are also superimposed over portraits of returned Australian military personnel. Through irony, the work introduces an otherwise invisible emotional dimension to the conflict. More hopefully, the very process of making the work speaks for a more positive form of engagement in our region. ✿ What was the reason for embroidering the works in Dark Horizon? I used embroideries to reference traditional methods of illustrative storytelling in the region. I want to emphasise that these are stories that are still being told. ✿ Why did you have them machine embroidered, rather than digitally? This a manual embroidery process where sewing machines are used. I chose this method over digital process because I enjoyed hands on process of the embroiderers and their interpretation of my images. It was a much more fluid process. ✿ What was the process of commissioning? I spend a fair bit of time in Yogyakarta, especially with the artists at Ace House Collective. Through them and some other contacts I was introduced to Eko Nugroho and DGTMB studios After face to face meetings with the studio managers, and a discussion of what was possible we produced these works together. My first embroideries with the studio were portraits, and we built together towards these more complicated landscapes. ✿ What do you like about working in Yogyakarta? Although my mother was born in Malaysia, my deeper heritage is in Indonesia—so it has always been a place I’ve wanted to explore. I find Yogyakarta particularly special because of the culture of the city. It has a population of around a million people, but because of the famous art school there and the relatively affordable cost of living, there are around 20 thousand artists. This is what I’ve been told anyway. There is also an amazing collectivist mentality that nurtures all kinds of creative practice. Not only has the city produced huge artists like Eko Nugroho, my generation of artists like Uji Handoko are starting to take the world by storm. I particularly like visiting ACE House Collective and Mes 56. ✿ Was the visual style influenced by Yogyakarta, as well as the production? Yes definitely. The smiles I have been using in my paintings and embroideries come directly from a Jogja aesthetic. When I went to Jogja for the first time I met artists from Taiwan, Germany, Korea and Holland. We all used a mix of broken English and emojis to communicate. This was a big influence on me. These smiley faces for me became 21st Century Hieroglyphics. ✿ What’s the story behind it being shown in New Zealand? Does it have a different meaning there? Dark Horizons is a show that talks about the Muslim experience, marginalisation, war, borders and colonisation in a way that is too risky for Australian institutions. Australia and New Zealand have many cultural similarities, but this is a conversation that would be impossible to have in this scale back home. ✿ How did the embroiderers interpret your image, beyond what you send them? The manual process of the embroidery meant the embroiderers would have to interpret my brush marks, and prioritise what they thought were the most relevant shapes. They also had to match the colours in their threads to match my images, and mostly these were interesting approximations. Clearly, there are issues related to the political position of Islam, as reflected in the policies and attitudes of countries like yours. What contribution might Muslim artists make to Australian culture beyond the geopolitical issues? I don’t know what difference Muslim artist can make to the broader Australian political landscape, but just our participation in the public discourse demonstrates an alternative narrative to the one being told. For all our apparent despotism and violence, when was the last time a Muslim army invaded a non-Muslim country, and compare that to its inverse? ✿ What were the instructions for making the work? Usually, the artist provides an image which is then taken by DGTMB embroidery team and embroidered. It is the team who does all the work based on the artist’s image. ✿ How was it made? The image is layered with a transparent sheet and a cotton cloth. The thread is selected based on the colours in the image, then the embroidering process starts. The system is similar to sewing, and the size of the embroidery machine is the same with the sewing machine. The difference is that the worker uses a wooden circle to pull the cloth to tighten it and then embroiders it. He also uses the hand to straighten the cloth and the thread. Beneath the embroidery machine, there is a lever operated from the thighs to direct the distance between threads. ✿ How long did it take? ✿ How did it compare with other commissions? Each image received by an artist has particular characteristics and so each work has different levels of difficulty. That is actually the challenge for DGTMB Art Embroidery, to create a work based on the expectation and image of the artist. There are commissioned works which use techniques of colour gradation needing up to 2-3 times embroidering, or blocking the colours, as well variations of colours. DGTMB Art Embroidery is labour-intensive (most of the works need manpower), initiated and coping with the embroidery standards of Eko Nugroho, the density of the threads, the embroidery’s thickness, and the large sizes (the size is limited when using computer embroidery). The longest embroidery made by the team had 9 meters, and the widest had 3 meters. 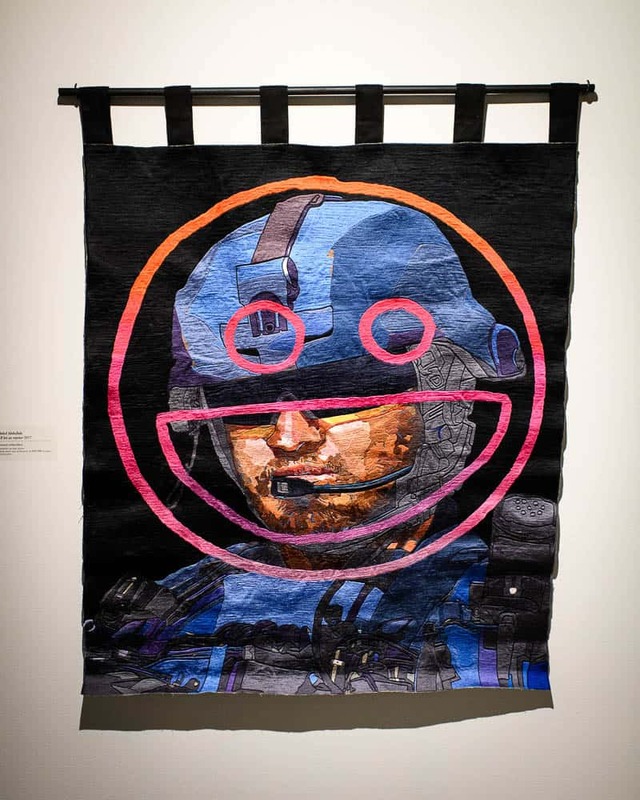 Eko started making embroidery works since 2002 while working on a project for DGTMB when he had the idea to transfer the image of the comic to embroidery as he was looking to new media experiments. At that time he already knew Rinto, the now long-term embroiderer at the studio. Rinto had a small stall for embroidering and Eko would visit to help transfer the images to embroidery, while also learning to do the embroideries himself. It was around 2007 when Eko proposed to Rinto to work together because Rinto was losing his job due to less demand for works and the appearance of computer embroidery. He was about to return to his hometown and become a farmer, when Eko visited him, concerned about the loss of his job and this local technique being replaced by the computer. He then proposed to work together for an embroidery work and he accepted. After that, they continued to work on other embroidery works. 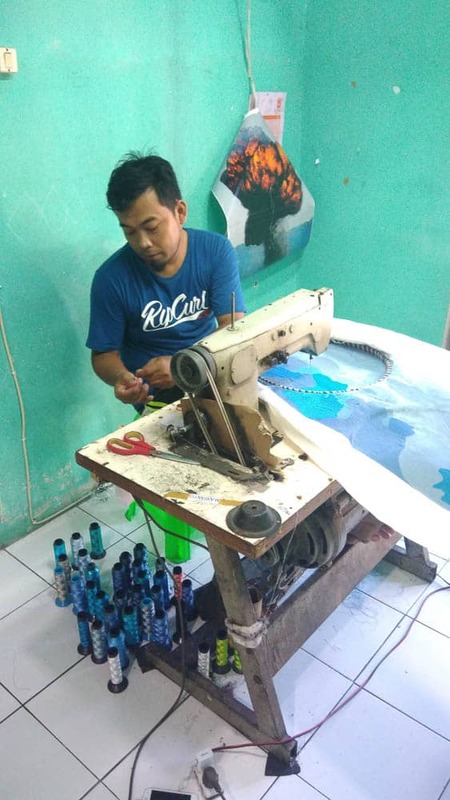 The production increased and Rinto was able to invite his fellow friends to get a job at the studio as embroiders. While expanding this new technique for works, Eko managed to introduce embroidery as a novel artistic medium in the art scene. At the present, the studio has five active people working in embroidering. The working process between Eko and the team always follow an intense communication process where they discuss the techniques used, or how to enlarge a work, introduce new colourings, etc. Eko also defined some general standards for the working technique, for instance, the tightness of the thread, the thickness of the embroidery and so forth. In 2015 Eko also opened up new possibilities for artists to produce embroidery works at the studio and it influenced artists to integrate it in their artworks as an artistic medium. The embroidery team is now made of Rinto and Soleh’s family and friends. They invited their family members to learn the skills and work together at the studio. So from one person at the beginning, the team expanded to two (Rinto and Soleh), and now we have five people working. They are all still young, with families. When Eko first met Rinto and Soleh, they weren’t yet married. They come from a region in West Java called Tasikmalaya, very well known for the embroidery skills. 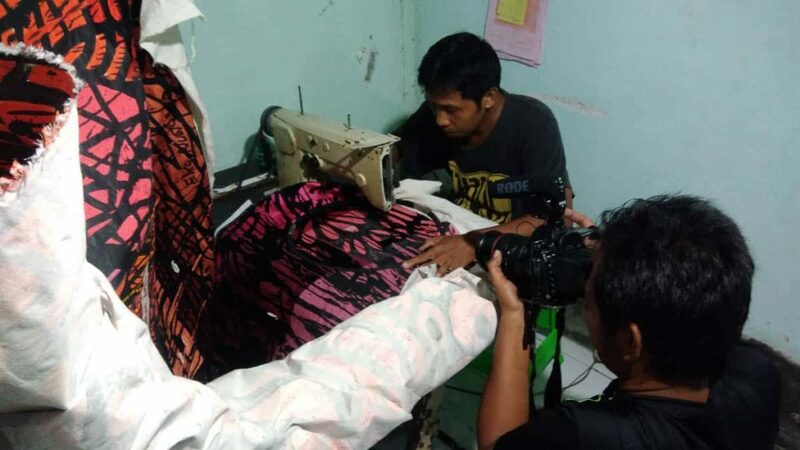 Growing up in that region, they learned the techniques from the elders who were also embroiderers and brought the knowledge to other regions, such as in Yogyakarta. There are prospects to enlarge the team and conserving and continuing embroidery as an important local legacy. The studio is very pleased to have already introduced and developed this new medium as an artistic medium in Indonesian contemporary arts. As well, artists also order embroidery at the studio, such as Abdul and also Sally Smart, Reko Rennie , and others. Abdul Abdullah was born in Perth, Australia in 1986 and currently resides in Sydney. He has a Masters of Fine Arts from the University of New South Wales, 2017 and a Bachelor of Art from Curtin University, 2008. He is an accomplished multi-disciplinary artists working across mediums including painting, photography, video, installation and performance. He has an impressive exhibition history with major projects throughout Australia and internationally, including recent works in Primavera at 25 at the Museum of Contemporary Art, 2016 and the 8th Asia Pacific Triennial at Queensland Art Gallery | Gallery of Modern Art, 2015. While still a relatively young artist, his high standing in the Australian art industry is reflected in the significant number of public collections in which his works are held, including the National Gallery of Australia, Canberra; the Art Gallery of Western Australia, Perth; Queensland Art Gallery | Gallery of Modern Art, Brisbane; the Museum of Contemporary Art, Sydney; the Islamic Museum of Australia, Melbourne; Campbelltown Arts Centre, Sydney and many more. Abdullah is represented by Fehily Contemporary, Melbourne and Yavuz Gallery, Singapore. Garland is a publication of World Crafts Council – Australia, a national entity of the World Crafts Council – Asia Pacific. This project has been assisted by the Australian Government through the Australia Council for the Arts, its arts funding and advisory body.